Caterpillar offers a complete range of forestry machines and work tools to meet the demanding application needs of the industry. The Cat® log handler range is one of many purpose- built machines specifically designed for the forestry application. The M325D MH is purpose-built to work productively and durably while offering maximum protection and comfort for the operator. The M325D MH is equipped with a hydraulic cab riser to maximize viewing to all sides of the machine, helping keep the operators productive. Powered by the Cat C7 engine with ACERTTM technology, the M325 MH offers better fuel efficiency and reduced engine wear. ACERT technology works at the point of combustion to optimize engine performance and provide low exhaust emissions. By combining ACERT technology with the new Economy Mode, customers can truly balance the demands of performance and fuel economy to suit their requirements and application. The Cat C7 engine is rated at 190 horsepower, combined with the one-touch automatic engine speed control which maximizes fuel efficiency and reduces sound levels. Caterpillar's design and manufacturing techniques deliver outstanding durability and service life. Booms and sticks, made up of welded box-section structures, are fabricated with thicker plates to withstand high stresses. The upper structure is built of higher strength material and thicker steel sections to handle the increased swing loads developed with the longer front parts, heavier counterweights and cab risers used in material handling. The M325D MH wheeled undercarriages provide maximum rigidity and long service life. 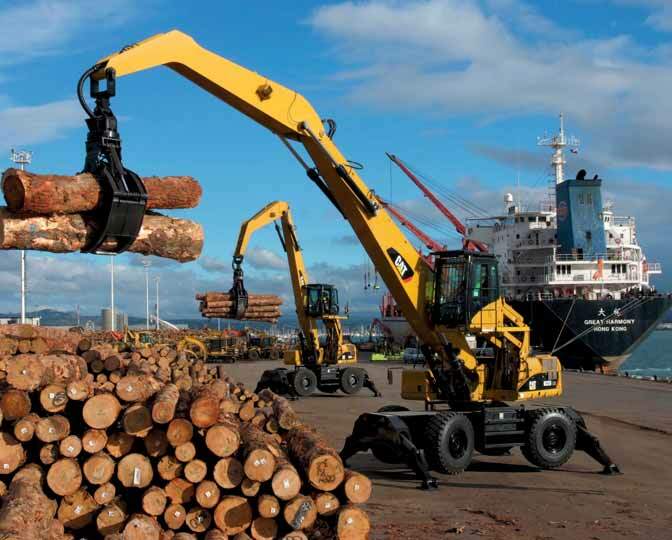 Manoeuvrability and speed is of the essence for log handling at port side and the Cat M325D MH log handler covers ground quickly, allowing operations to run at optimal efficiency. Excellent control, impressive lift capacity, simplified service and more comfortable operator station increase productivity and help lower operating costs. All these features are designed for ease of operation, high visibility and comfort, which allows the operator to focus on production. With the log handling job in mind, this machine is equipped with a 2.6m hydraulic cab riser to maximize viewing to all sides of the machine. The hydraulic cab-riser system features patented ‘ground entry and exit’ with a step-in cab, enhancing safety for operators and service personnel. Cab height is adjustable to an eye level of 6.1m. Adjustable sensors control the height of the cab above the ground. A manual safety override in the cab allows the operator to lower the riser in the event of engine power loss. The 70/30 split front windshield allows the upper portion of the windshield to be stored in overhead position with one-touch action release system. The lower portion can be removed and stored inside the cab. The M325D is equipped with an impact-absorbing falling objects guarding system (FOGS) that protects the operator from flying or falling debris in the work area. Service locations are easily accessible by ascending to the maintenance walkways allowing critical maintenance to get done quickly and efficiently.